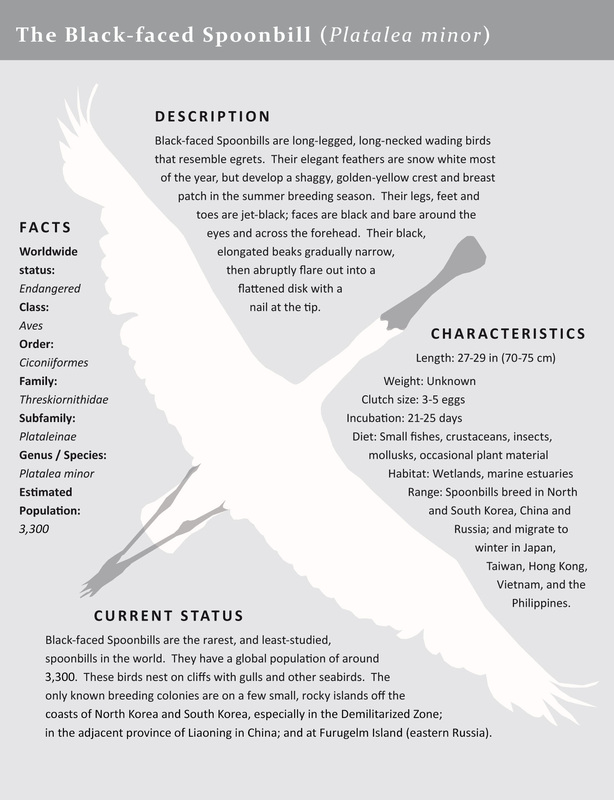 Home > Research > What is the Black-faced Spoonbill? Can you give me a one-page overview? How endangered is this species? Very. The total population of the Black-faced Spoonbill (or simply “spoonbill” on this page) is only 3,272, according to the (January) 2015 International Black-faced Spoonbill Census. Between 2010 and 2011, the count dropped from a previous high of 2,347 to only 1,848 — a 20% decline that mystified the census-takers — but rebounded in 2012 to another new high of 2,693. Although the population has grown more than tenfold from drastic lows twenty-five years ago, it has not yet recovered to a self-sustaining level. Where does it breed and migrate? 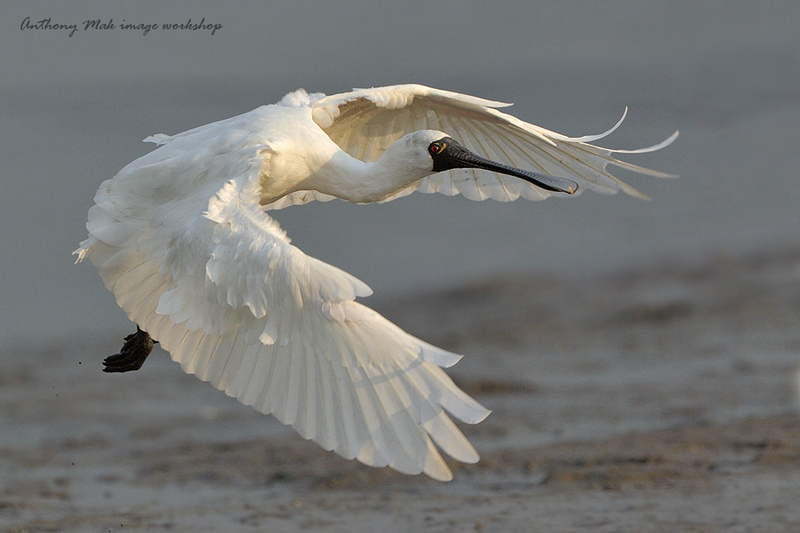 The Black-faced Spoonbill lives and migrates along a portion of the East Asian-Australasian Flyway, in North and South Korea, Japan, Taiwan, coastal China (including Hong Kong and Macau), the Philippines, Vietnam, and northeastern Russia. What is happening along its migration route (flyway)? The Mai Po Nature Reserve in Hong Kong and the creation of the Southwest Coast National Scenic Area in Taiwan have gone a long way to fend off the loss of habitat, but many of the wintering and breeding sites along the bird’s flyway are not protected. These sites face pressure from urbanization, pollution, coastal erosion, and more. The tidal flat habitat around Incheon, South Korea, is also rapidly being destroyed. (See our Tidal Power in South Korea campaign and our Song Do Tidal Flats campaign.) Scientists in Korea and abroad have concluded that these tidal flats are among the most critical wetlands in the world, supporting several species in numbers that exceed the criteria established by the Ramsar Convention. Although our research focuses on the Black-faced Spoonbill, other scientists note that the Relict Gull and Chinese Egret are in dangerous declines due to previous “reclamation” (filling) here. The Saunders’s Gull, Black-tailed Godwit, and Nordmann’s Greenshank are among other threatened and/or endangered species dependent on these tidal flats. What are some sustainable development alternatives for areas where there are Black-faced Spoonbills? SAVE and other defenders of the spoonbill are spearheading an international effort to identify all sites where spoonbills breed and winter, and to propose alternative plans for the areas where there are threats to habitat loss. Tourism offers great potential for creating new jobs and promoting international understanding in areas of sensitive natural landscapes. In Taiwan, entrepreneurs in the Southwest Coast (formerly Yunchianan) National Scenic Area are using their own resources to capitalize on the presence of the Black-faced Spoonbill and the rich assortment of birds and wildlife in Chiku Lagoon. The tourism industry in southwest Taiwan has grown 15 times since 1997, largely because of this new National Scenic Area, and it now attracts nearly 4 million visitors each year. Fishermen, conservationists, environmental educators, and tourist operators are beginning to do the same on South Korea’s Ganghwa Island. The spoonbill’s habitat areas and related natural resources are essential ingredients to a strong tourist economy, but they are under threat by poorly planned urbanization. Do you have a photograph of a Black-faced Spoonbill?